Happy Sunday! Here’s a weekend waterview and what we looked like on Thursday as our snow started to melt. 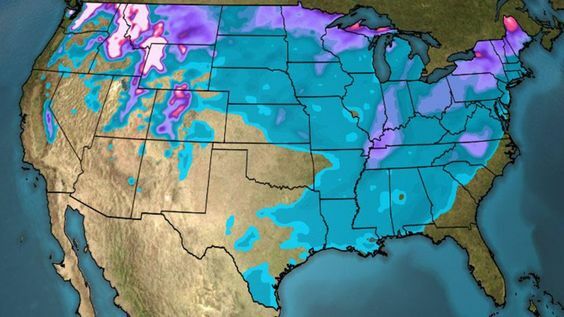 According the The Weather Channel, all 50 states in the U.S. had either snow or sleet on the ground on Wednesday courtesy of Winter Storm Inga. Snow and Sleet Covered the Ground in Parts of All 50 States Wednesday. Computer model analysis of snow and ice cover on Wednesday. Purple and pink shadings show the deepest snow cover while blue represents lighter amounts. Our snowy blanket of 7 inches from Wednesday is mostly melted as of this morning with temperatures in the upper 50s and 60s this weekend. Here’s a bird’s-eye view of our snowy landscape. I took the photo out of the upstairs window while checking to see if our tarp was still in place from our storm damage. Now that the snow is gone, my hubby is climbing up today to see if it needs reinforcing. It looks like it’s going to be a while before repairs are made. I always look forward to a little snow in January or February, since it doesn’t hang around very long. Dear Mother Nature: The bridal wreath spirea, snowball bush and azaleas all respectfully request no snow or freezing temperatures in March or April please. Keep Calm and Winter On projects and recipes, HERE. Beautiful pictures. Nice to have a little excitement that doesn’t last long. Sorry, it might be a while before your damage can be repaired. Be careful climbing up there. Beautiful! I always enjoy your photos, especially of the lake. Beautiful photography…..all 50 states but here in the great northwest, above Seattle in Bellingham, close to the Canadian border not a flake. Stunning weekend post! Mary, your snowy photos are beautiful. We are in store for a gorgeous Sunday with a high of 65. Wednesday morning our low was 9 and wind chill in the negative. Welcome to our South! So incredibly beautiful Mary!! I know it came at a price for you though, I hope things are getting back to normal now. We are going to be in the high 60s today, 🎉 I’ve never been so cold in my life as I was last week! Did Chloe & Gracie like that deep snow? There is something about the beauty of snow that makes it more accepting of the bitter cold!…Your photos are gorgeous…I mentioned to my hubby as we were crossing over Jordan Lake near our home that the lake looks so gorgeous with the snow on it’s banks and the trees….such a true sense of peace and calm…..but glad that is is now melting so I can run the roads! Have a great weekend Mary! These are beautiful visual descriptions of our snow! Definitely eye candy! I had no idea we got 7 inches….I just knew it was a lot but after living in New York……I knew it would be short lived so I enjoyed it immensely! Thanks so sharing all your skills with us! This winter has been one to remember. I expect it to be cold in Maine which is why we don’t winter there, but the cold in houston has been quite a surprise. It’s also been very hard on plants. Beautiful pictures, our azaleas also request no snow in April, LOL!! Very pretty. I am in a pink/purple area and snow loses its luster by now. It is still a good three months until spring and sometimes our snow is still here in May. Love the snowy fence shot. Oh, my… what a winter! My husband said it look like you made new white cushions for your wicker set. I’m hoping for the warming trend to continue, too! I enjoyed seeing your pretty photos of the snow, Mary. Your property looks like a winter wonderland! The beauty of winter wonderland, when snow makes the world look pristine! I was scrolling through the photos looking for puppy paw prints in the snow; that’s the only thing better than fresh snow :) Enjoy the day, and thanks for the great photos! Bonsoir….magnifiques photos et superbes paysages….Votre blog est magique un véritable réconfort….j adore ! Merci pour vos visites et doux commentaires Catherine! Thank you so much for sharing your lovely view with us! I am in Chicagoland, and I am green both literally (at 42 degrees today) and figuratively. Enjoy! Gorgeous snow pictures! Thanks for sharing! The area where I live in Virginia got maybe an inch of snow–it didn’t last long. Your photos are beautiful!! Yesterday and today it has been in the mid-60’s. Looking forward to spring. The temperatures will be going back into the 40’s later this week. Be careful when doing repairs. Very pretty view , no snow here just fog! I love your iron fence, does it go into a secret garden?! Beautiful landscape photos. I have often thought of being a meteorologist in my next life too. A well paid profession that only needs to be correct 50% of the time!! I am from MN so am tired of snow and this year 3 weeks of below zero weather. Being a fellow gardener I am so ready for spring! Already going through catalogs and planning gardens for spring. Enjoy the quiet beauty of snow–especially nice when it is short lived! Beautiful! …but glad I don’t have to experience it first hand!